LOS ANGELES — Blake Griffin had a good feeling about his shot early in the game, and when that happens, there’s only one thing to do. "When shots are falling, honestly, you just keep shooting," he said. And so he did. Virtually everything he threw toward the basket went in. His 37 points on 14-of-16 shooting propelled the Clippers to a 112-105 win over the Phoenix Suns at Staples Center, their eighth consecutive victory. Griffin had an eventful night. He fouled out with 3 minutes 23 seconds left in the fourth quarter, and the Clippers’ 10-point lead was pared to six in less than a minute. And he was at the center of a scuffle with Suns forward P.J. Tucker, who threw a forearm at Griffin after they fell to the floor under the Phoenix basket with 5:28 left. Griffin kept his cool. Players from both teams converged on him and Tucker, so there was little time to retaliate. But Tucker was assessed a loose ball foul and a technical foul and was ejected. Griffin stayed in. "(We) got tangled up, went down and I took a little forearm," Griffin said. "But it happens. I’ll let somebody else handle that." He was talking about the NBA, which could hand Tucker a suspension and/or fine for throwing a punch that connected with Griffin’s chin. Clippers coach Doc Rivers praised Griffin for showing restraint at an emotional moment. Retaliation would have been easy, but it also would have been costly to lose the team’s best player as the Suns were making a late run to get back in the game. "I think they got it right," Rivers said of the game officials. "Blake gets hit as much as anybody in the league. We’ve all seen it. It gets old. I think he’s doing the right thing. He puts his arms up because if he reacts like some people think he should, he gets thrown out and it hurts the team. "I know it’s very difficult for him, but he’s doing the right thing for the team." Griffin was hot offensively from the beginning. He made 8 of 9 shots in the first quarter for 22 points, one off the franchise record for points in a quarter. He had 29 at halftime and seemed within reach of passing his career high of 47, set in January 2011, when he had 37 after three periods. "That was crazy," guard Chris Paul said. "I didn’t even realize he had 22 in the first quarter until halftime. I felt like the biggest dummy because he probably should’ve gotten the ball more than he did." The Clippers had a 25-point lead at the 7:14 mark of the third quarter, but it dwindled by the fourth. When Griffin and Tucker scuffled, the lead was 14. When Griffin fouled out, it was 10. 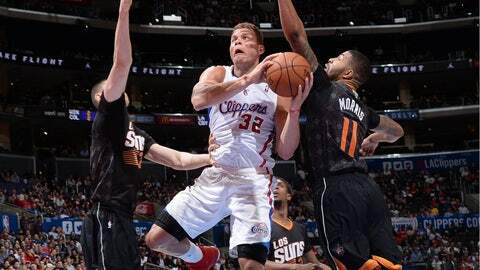 Then it became six, 105-99, when Suns guard Goran Dragic drove for a layup off the break. "We had the big lead," Rivers said. "You could see it slipping away." Then, acknowledging Phoenix’s struggle to claim the eighth and final playoff spot in the Western Conference, he added, "They’re playing for their lives. You knew they were not going away." But a 16-footer by Paul and good free-throw shooting in the final minute secured the win. "You can’t let up," Paul said. "Our defense is what gets us that lead, and then you sort of get a little lax, and that’s what we can’t do. We just have to get more consistent with it."